We are often asked “what’s next in marketing?” With the rise of visual content we’ve watched photography take center stage. Instagram and Pinterest have shown us how important it is to make our messages esthetically pleasing while communicating at-a-glance. Tumblr has become popular for looping GIFs and Twitter has experimented with small packets of looping mobile video. The answer to “what’s next” is video. Brands With Fans decided to explore the topic with expert Cindy Matalucci of The Pulse, an interview style video marketing company where she is the founder, executive producer and host. What better way to do it than with our first ever video blog! In this three part series Fandom Marketing founder & Brands With Fans editor in chief, Melonie Gallegos interviews Cindy to uncover ways video can benefit your marketing plan. Be sure to subscribe to our blog in the top right to get the next episode. 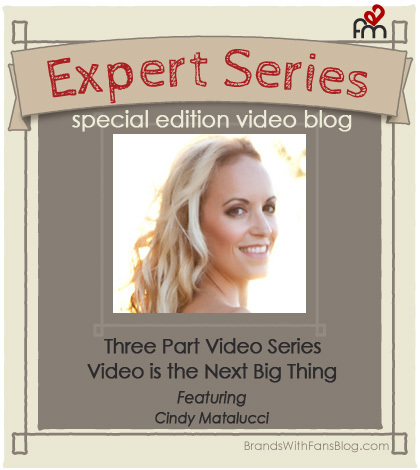 In part one below you will learn the benefits of video marketing, where video fits in today’s marketing mix, how to make your brand more engaging with video, the difference between unproduced video for social media, and ways to leverage it for PR. Cindy, the found, executive producer and host of The Pulse, an interview style marketing company. She will come to your event or business, try your products and services on camera, talk to some of your best clients, and give your potential customers an inside view of your company. The Pulse is all about fun, and making your video an interactive, natural experience. Instead of talking to a camera, clients have a real conversation with Cindy, in a relaxed setting, with a tailored set of questions to target potential clients.